IIUM Sports & Recreational Centre will be organizing the 3rd IIUM Chess Invitational Tournament 2010 scheduled to be held from 31st December 2010 until 2nd January 2011 at Cultural Activity Centre (CAC), International Islamic University Malaysia (IIUM), Gombak. 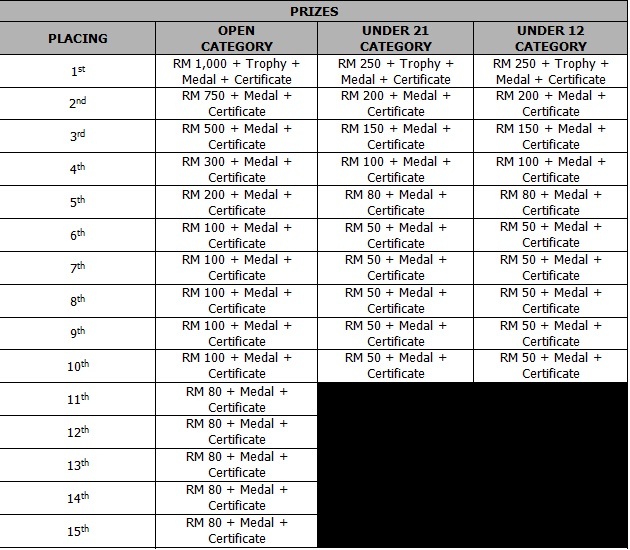 This tournament will be divided into three categories which are open category, under-21 category and under-12 category. The time control is 25 minutes per game/per player. * This tournament is open to a limited number of participants based on first come first serve basis. Please pre-register your entry before the closing date stated. 1) This tournament is restricted to FIDE laws of tournament. 2) The time control is 25 minutes per game/per player. The adjustment of this time control is due to the numbers of participants. 3) One winner is eligible to one prize only. 4) All decisions are final.